InvisiClues for Cornerstone Personally, I doubt these exist, but they are clearly listed in the product inventory included with some later issues of The Status Line, and it even gives an IPC number. Priced at $14.95, so it likely refers to the Building Applications book, although the IPC is nowhere to be found on it. BC1-BOK ??? "Off the Record" Cornerstone newsletter, mentioned in the "Customer Assurance Program" flyer and by name in the larger "How to Get Started" booklet. Described as a quarterly newsletter, though I have no idea how many issues were printed and sent out. 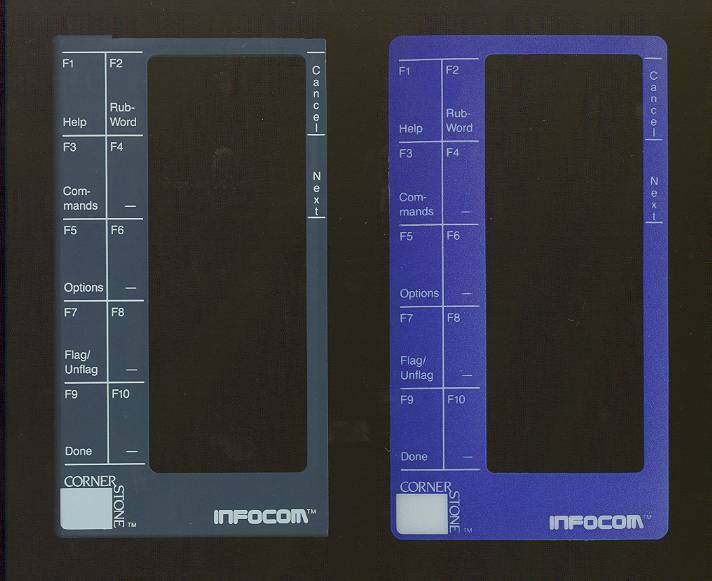 A former Infocom employee has confirmed that at least Vol 1, No 1 exists, and suspects that this was the only one. ??? ??? For more details on the contents of Cornerstone, refer to the appropriate Shoppe column. 1.0 03/22/2003 Initial version of the Cornerstone Database Database. 1.1 05/12/2003 Added details about the Micro/Answer package. Corrected the source of the "How To Choose" brochure, which was included with at least one issue of The Status Line. 1.2 09/22/2003 Added the 30-day evaluation form and cover letter to the parts list. Added details on the cardboard shipping carton, and slipcover (including CS part number). 1.5 11/3/2013 Added entry for the demo packet mailing envelope, and modified a few details on the demo packet contents. 1.6 5/9/2015 Added new entries for recently acquired items, revised and clarified some earlier entries, some formatting changes. 1.7 5/25/2015 Revised notes on the alternate title of the Cornerstone book, after hearing from the author herself. 1.8 5/2/2017 Added notes on the Cornerstone dealer kit after being contacted by a collector who owns one.